The School of Health Sciences held its sixth annual 'Health’s Got Talent' event towards the end of June to promote excellence in education within the School. Staff were asked to submit a project or innovation that they thought was worthy of recognition. Presenting their idea to an audience of their peers from across the School, a panel of four judges – including Professor Debra Salmon, Dean of the School of Health Sciences; Professor Pam Parker, Deputy Director of the Department for Learning Enhancement and Development; Patrick Burke, a service user adviser to the School; and Malek Arab, Vice President of Education from the City Students’ Union - chose the most innovative project. In an extremely high-quality field the winning project was created by Dr Irene Ctori, Farah Mohamed, Andreas Oskis, Dr. Ahalya Subramanian and Dr Peter Jones. The project, called ‘Teaching empathy by simulated practice in Optometry. The TESPO project’, used virtual reality (VR) to enable students to put themselves into ‘the eyes’ of someone with visual impairment. 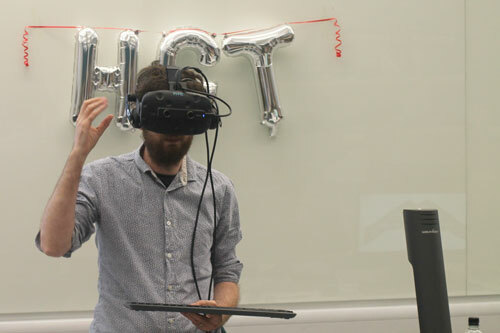 Taking real health data and turning it into a digital filter in VR googles, the system – which is the first of its kind in the world – gave the students a real-life experience of sight loss. Although the aim was to improve empathy in students, it was seen that students already had very high levels of empathy and there was no a noticeable improvement. Innovation in assessment: pitching a service improvement initiative (Dr. Caroline McGraw, Matt Goral and Connie Tse) – the initiate used a new assessment strategy in the form of a creative three minute digital pitch video on a proposed service user innovation, and a shorter written component to replace a 3,000 word essay. Tic Tac medicines (Karen Rawlings-Anderson and Janet Hunter) – the project used tic tacs to educate students about medicine management, and the issues patients have with taking medication and sticking to their regime. Developing video-led educational resources to support teaching in Optometry (Dr. Tamsin Callaghan, Fariha Choi and students) - this project, which involved students, used video to help optometry students with their focimeter exam and helped guide them through areas they found difficult. Introducing online activities to support clinical decision-making skills for post-registration nurses (Kat Millward and Anne-Louise Robens) – the project used videos to develop clinical decision-making skills, such as history taking, and modelled both good and bad clinical practice. Such use of video helped support learning and also enabled theory to be applied at their own pace. The use of Bioscience Word Journal and its impact on knowledge, understanding and confidence in using biosciences terminology (Maria Dingle) – the project used a series of short videos uploaded to Moodle to help students with bioscience words, how they’re pronounced and also what they mean. Each word related to a lecture taking place that week and helped students gain a greater understanding of that particular subject, as well has helping with confidence and comprehension. Using cases to improve student outcomes from Enquiry-based leaning to explicit instruction (Lucy Myers) – this project used case-based learning, and four particular cases across the age-range, to help pre-registration Speech and Language Therapy students understand developmental language disorders. The Final Countdown: Using timers within large group teaching (Sally Morgan) – used custom and novel timers to help manage time during lecturers with regards to Poll Everywhere and also lecture starts and breaks. A peer-to-peer learning event in the Virtual Environment Radiotherapy Training (VERT) room for Year 1 and Year 2 undergraduate radiotherapy students (Liam Mannion, Chris O’Sullivan and student) – year 2 radiotherapy students facilitated a learning event as peer mentors for year 1 students with lecturers on hand for support. Focusing on personal and patient safety as well as accuracy in treatment delivery, the event boosted awareness, skill, confidence and accuracy of both student cohorts. The people’s choice award, a new category for this year, was also won by the VERT project. “Health Has Got Talent 2018 really demonstrated what a fantastic range of talent we have in the School of Health Sciences, with a strong theme of interdisciplinary collaboration between staff, students and service users evident this year.